Real property in North Dakota consists of land, that which is affixed to land, that which is incidental or appurtenant to land, and that which is immovable by law (47-01-03). Title to real property can be transferred with an instrument in writing, such as a grant deed, which is sufficient to transfer title in this state. 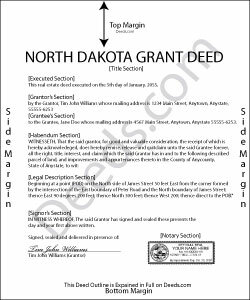 The use of the word "grant" in a real estate conveyance in North Dakota will imply the following covenants, and none other, from the grantor to the grantee: (1) Previous to the execution of the conveyance, the grantor has not conveyed the same estate, or any right, title or interest therein to any person other than the grantee, and (2) that such estate is, at the time of execution of the conveyance, free from any encumbrances done, made, or suffered by the grantor, or any person claiming under the grantor (47-10-19). The statutory form for a conveyance of real estate is in section 47-10-06 of the North Dakota Century Code. In order to be considered for recordation by a county clerk or recorder in North Dakota, a grant deed must contain the grantor's original signature and a proper acknowledgment (47-19-03). If the deed is not acknowledged as required, it must be proved by a subscribing witness before it can be recorded (47-10-05). A grant deed in North Dakota can be acknowledged before a judge or clerk of the Supreme Court or a notary public (47-19-13). A city mayor, a recorder, or a county auditor can also take acknowledgments, but only within their own district (47-19-14). A deed acknowledged out-of-state will be accepted for recording in North Dakota if it has been acknowledged according to the laws of such state (47-19-35). The officer taking proof or acknowledgment of a deed must endorse or attach a certificate to the deed, and such certification must be in substantially the same form provided in section 47-19-27 of the North Dakota Century Code. Some grant deeds will need to have an auditor's certificate of transfer and a completed Statement of Full Consideration in order to be recorded (11-18-02 and 11-18-02.2). A grant deed that has been duly signed, acknowledged or proved, and recorded in the county where the property is located will be deemed to provide constructive notice of the contents of the instrument, as it appears of record, to all persons (47-19-19). An unrecorded grant deed will be valid between the parties to the instrument and those who have notice thereof (47-19-46). An unrecorded grant deed will also be void against any subsequent purchaser in good faith, and for a valuable consideration, of the same real estate or portion thereof, whose conveyance is first deposited with the recorder and subsequently recorded, whether or not it is entitled to be recorded, or as against any attachment levied thereon or any judgment lawfully obtained at the suit of any party, against the person in whose name the title to such land appears of record, prior to the recording of such conveyance (47-19-41).